IT’S TOUGH MAKING money roasting coffee a pound at a time, at least when you’re selling beans by the bag. It almost seems absurd to roast three 1-pound cycles an hour, four hours a day, five days a week. And not just roasting—what about selecting your green, blending and sweeping chaff from far and near? You might finish off the month with 224 pounds of coffee and a grand total of $1,500 in sales. But if your main revenue is serving your own specialty coffee drinks at retail, is it worth the effort to roast? Earlier this year, the pair debuted Sterling Coffee Roasters, a coffee cart showcasing fresh-roasted coffee from a 1-pound refurbished San Franciscan drum roaster that customers can see in action. In addition to whole bean, the cart also offers espresso, press and single-serve. We all know that coffee tastes better when it’s been fresh roasted. And buying green coffee in small quantities is easier than it’s ever been. So it’s no wonder that businesses focusing on roasting small batches—as well as those that regularly use 1- to 2-pound roasters to fulfill smaller orders—are popping up around the country. Whether you are just starting to roast or are considering expanding your roasting arsenal, here are a few tips from small-batch roasters to help you incorporate a single-pound roaster into your business. Interested in launching a roasting business? Working with small-batch machines allows roasters to launch their businesses with small initial investments and grow their companies organically, as their markets expand. Even for coffee-industry veterans, a small start-up with a single-pound roaster can prove to be a relaxed way to relocate a business or start a new one. Recently, Charlotte Crawford moved from the Pacific Northwest to farmland outside Nashville. There, she realized there was an untapped market for higher-quality coffee roasted locally. She purchased a Diedrich IR-3, expecting to start a small wholesale roasting shop. But she discovered that she missed working with people—so she shifted gears. From her years in the espresso industry in Seattle, Crawford still owned a Sonofresco 1-pound roaster and grinders. She decided to integrate a roasting business, which she called Rocky Top Coffee, with an espresso catering business, which she dubbed Latte Elegance Catering. She invested about $10,000 on a catering cart, two new espresso machines, a truck ramp and a website. “It was an inexpensive start up, without the build-out cost of a fixed location, and seemed like an unmet need in the area,” Crawford recalls. She’s now roasting for musicians who play in Nashville, as well as for a premium ice-cream maker in the area, without worrying about how to recoup her initial investment. For anyone new to coffee, roasting with a smaller machine can be a valuable learning experience. New roasters can learn how beans react during the roasting process and cup the results. And then do it all over again. 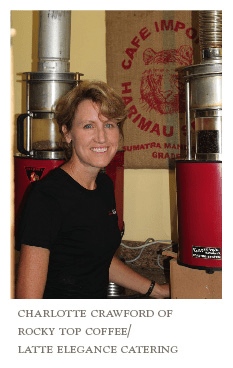 “What small-batch roasting afforded me the opportunity to do is to cut my teeth on learning how to roast coffee and living with the mistakes,” says Mary Tellie, founder and CEO of Electric City Roasting Company in Scranton, Penn., who started her business with a single-pound roaster. For those new to roasting, purchasing a small-batch machine allows operators to get their feet wet and decide whether they truly want to remain on the roasting side of the business—before they make an investment in a larger machine. McGovern considered purchasing a large roaster and afterburner, but when he wasn’t able to secure the start-up capital for the purchase, he decided to go small. 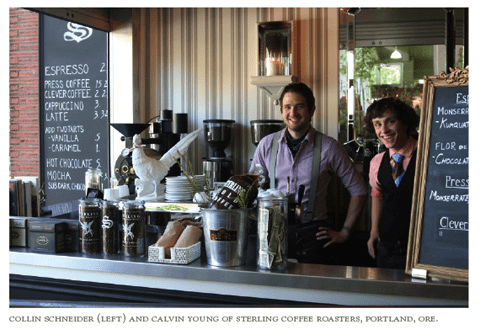 He tracked down a refurbished 1-pound San Franciscan sample roaster and opened a coffee cart called Sterling Coffee Roasters in a busy shopping district in Portland. He had no roasting experience, but he and his business partner were keen on experimentation. Tellie launched Electric City in 2003 with a single 1-pound Sonofresco roaster. She has since expanded her collection to include four 1-pound Sonofresco roasters, a 1-pound Sonofresco sample roaster, a Probat L-12, as well as half-bag and one-bag Diedrich roasters, and is on track to roast 60,000 pounds of coffee this year. The variety of machines gives Electric City extraordinary flexibility, allowing Tellie to fulfill both small and large orders, roasting just enough for the order without firing up large roasters for tiny batches. 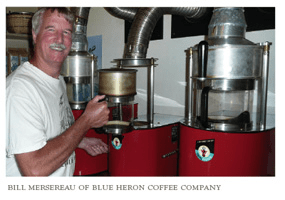 Similarly, Mersereau decided to stick with small roasters when he retired from his full-time job and turned his focus entirely on Blue Heron Coffee in 2008. 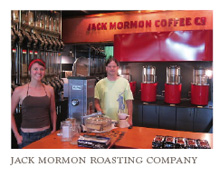 He traded in two of his 1-pound roasters, replacing them with two 2-pound roasters. The setup gives Mersereau the flexibility to change the amount of coffee he roasts from day to day, or hour to hour. 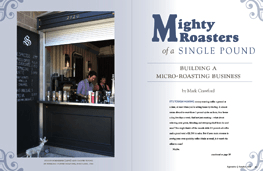 “I can [roast] as little as 1 pound or as much as 5 pounds at a time,” he says. For roasters who sell 50 pounds or more of coffee every day or two, relying on a single-pound roaster to do the job doesn’t make much financial sense—labor costs will add up quickly, canceling out profits. As Rowland notes, decreasing waste is a boon to his bottom line. His frugality extends even further—he uses a coffee extractor to create a cold brew from coffee that has been sitting around for more than two days. In many ways, buying quality green coffee for a small roastery is easier than it ever has been. With the availability of microlots and options for direct trade, roasters can get their hands on exceptional coffees. Of course, single-pound roasters won’t qualify for volume discounts, so they should expect to pay a premium for their green beans. Rowland purchases green coffee by the bag. He stores them at his importers’ warehouses until he accumulates 10 bags (one pallet) to save on shipping costs. Mersereau, on the other hand, saves on shipping by purchasing his coffee as needed from the nearby Sonofresco office. Though some aged coffees have become highly sought after, many roasters believe that green coffee doesn’t age, it stales. Keeping green coffee fresh is even more relevant when a business is roasting only a few pounds of coffee an hour. Like any roaster, single-pounders need to be properly cleaned and maintained for the best performance. Rowland says his 1-pound roasters are workhorses. “This is our fourth year, and we run them all day, six days a week,” he says. Safety comes first when working with any roaster, large or small, notes Tellie. “If you think you’re going to breach a safety protocol, or if you don’t have any kind of roaster maintenance in place, then you should get some quickly,” she says. Single-origin or blend? Often roasters offer both options, giving customers the opportunity to choose between a consistent cup and an ever-changing array of coffees from around the world. Mersereau agrees. He offers 10 different blends in addition to single-origins, all roasted to order in small batches. “I have more people who come to like the blends more than the single-origins,” Mersereau notes. But some micro-roasters are bucking the blend trend. Starting a roasting business with a single-pound roaster is certainly a safer, less intimidating way to build a business. The start-up costs are minimal—all it requires is the roaster operator’s time. If a business continues to sell increasing amounts of coffee, however, it may be difficult to keep up with demand without hiring help and investing in a larger machine. In many ways, these micro-roasters have embraced the flexibility of using larger roasters to handle growth. Electric City roasts about 80 percent of its coffee on its larger roasters, while Sterling roasts 60 to 70 percent on its 10-kilo machine and Jack Mormon uses its Sivetz fluid-beds to roast about 40 percent of its beans. But all three of these businesses also hang onto their single-pound roasters for smaller orders. It’s clear that small roasters offer a way to break into the coffee industry at a minimal cost and give businesses the flexibility to roast in small increments as needed. “If you didn’t have the small-batch roasters, you wouldn’t have a lot of the middle-size roasters you have today,” Tellie says. “I think that they started small and they were able to grow. Mark Crawford is director of business development for Mont Blanc Gourmet and, when home, enjoys his morning espresso macchiato crafted by his wife, Charlotte Crawford. He can be reached at mark@montblancgourmet.com.